Kelly & Riley are Outer Banks locals with roots that run deep in the community. Their wedding was a destination wedding for some but hometown wedding for others. Their boho wedding was featured on Burnett’s Boards last year so below is the writeup from that feature! 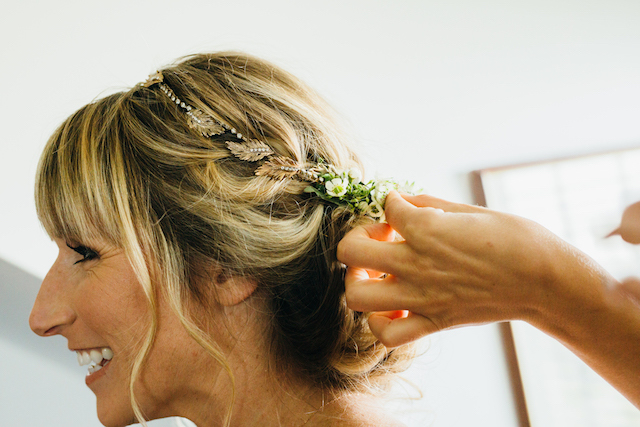 Kelly & Riley’s wedding was the kind that you just felt so fortunate to be a part of! Their love story spans over a decade and they made sure to bring many heartfelt details to their day. These two newlyweds are the masterminds behind popular local brand, Local As It Gets, and they truly live that name – incorporating local & heirloom components to their wedding wherever possible! Their wedding felt like a tribute to their love, their family & friends, and to the history of their surroundings. It all started with the engagement – the couple had diamonds from both Riley’s maternal grandmother & Kelly’s maternal grandmother set in a custom designed engagement ring – featuring 4 diamonds and a rose gold color – it’s truly one of a kind! Kelly wanted Riley’s ring to be just as unique, so she found a North Carolina artisan who created the groom’s wedding band out of salvaged teak wood from the decks of the USS North Carolina, a battleship from WWII, combined with copper to match her own & wood from a Jack Daniels whiskey barrel. For the ceremony, the fathers of both the bride & groom hand-made wood benches for the family to sit on & the guests all walked through vintage doors circa 1880’s from the groom’s family property. The bride & groom exchanged their own vows surrounded by family & friends and on the banks of the Roanoke Sound, in an area Kelly frequented growing up! Kelly wore a headpiece that also incorporated two of her Grandmother’s blue earrings – her something blue – and also carried her Great Grandmother’s handkerchief – her something old! For later in the day when the sun dipped low, Kelly commissioned a local artist, Tanya Dulyaba to handpaint a custom design featuring her new last name. Both had a large group of bridesmaids & groomsmen and to honor their individual personalities, they had everyone dress in what they felt comfortable in! This mismatched look looked so amazing together – especially the ladies’ mix of prints, lace, furs and more! The reception took place in the middle of a century old pecan field in tiny Manns Harbor, NC – just across the bridge from the well-known vacation spots in the Outer Banks and around the corner where they grew up and still live today. Just like the pecan trees, Riley’s family has called this area home for over 100 years! The reception paid respect to the land – keeping everything al fresco with farm tables & bistro lights over head and the centerpieces of greenery, succulents, moss and more looked like they could have been found on the property. 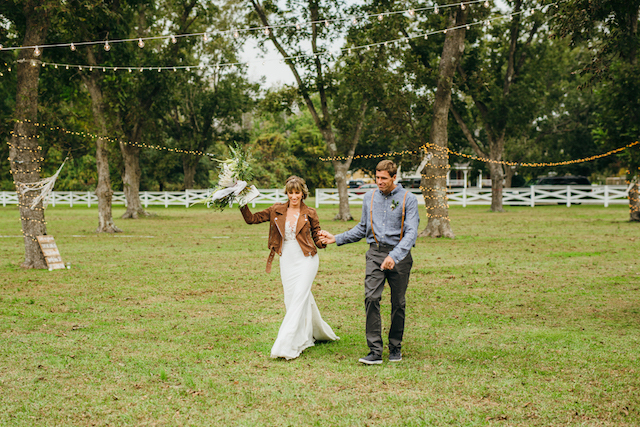 The overall theme the bride & groom were going for was a boho festival – they opted not to do many of the traditional wedding elements like introductions, formal dinner, etc & created a laid-back, organic celebration! As guests entered the field, they were greeted by handmade dream catchers made by local artisan Shannon of The Shabby Dream Shop as well as customs signs & candlelight. Each of the tables featured a different tablescape and mismatched vintage chairs, as well as different styes of handmade fabric napkins. The sweetheart table & benches were also custom made by the bride’s father & adorned with real furs that had been trapped by the family. The bonfire and lounge areas with blankets & quilts made by family members kept everyone cozy as the temperature dipped in the evening. The farm to table menu kept things as fresh as possible – the produce came from nearby Somerset farm, the seafood from the local waters and was served by talented caterers Cafe Lachine & Basnight’s Lone Cedar Cafe! That pecan field that served as the reception location? It’s the source of the very same pecans used to make Kill Devil Pecan Honey Rum, distilled locally by Outer Banks Distilling in Manteo, that the bartenders of Camp Cocktail served in artisan cocktails out of their vintage camper turned mobile bar! The signature cocktail featuring the pecan honey rum was appropriately called the “Local As It Gets”! 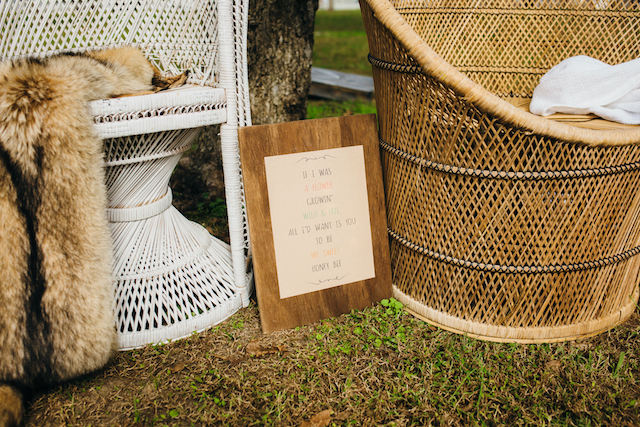 At each seat, guests found a bag of fresh coffee beans by local coffee shop & roastery, Morning View, stamped with the quote ” Paradise – this morning, with her, having coffee” – Johnny Cash. Their love of good coffee was also brought back at dessert time when homemade artisan donuts & donut holes were served alongside cake & coffee. Here’s also a snippet of part of their wedding video by Kenyon Productions – watch here!